I love this card trick quilt, I guess because it was my first pieced quilt. It was very patient with me as I struggled to learn the in's and out's of quilting before discovering the "blogging classroom". 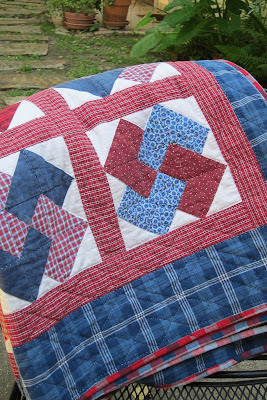 But something has bothered me about this quilt for a while. I had this real cool plaid fabric and couldn't find anything to use it in, till I saw it sitting next to the card trick quilt. and it has a card trick quilt pattern in it, featuring Sweetwater's Hometown line. That's a pretty tricky block for a first quilt. Great job! I like the new binding too. thanks Leila . . . yea, I definitely wouldn't recommend it for a beginner. I gained a great education on that one.